The Dirt Doctor will see you now – The Fonz, De Reuver and fried chicken. But for me, the benchmark of doing crazy stuff on mo’sickles has to be when Arthur Herbert Fonzarelli jumped 14 garbage cans on what looked suspiciously like a 1949 Triumph Trophy TR5 Scrambler Custom (thank you Google). Screw Evel and his double deckers or Matt ‘The Kangeroo Kid’ Coulter leaping a steamboat on his quad – the Fonz hitting the ramps and then stacking it into Arnold’s Fried Chicken stand is the beginning and ending of FMX for me. Anyway, what I’m getting at is Happy Days! Following the ACU enquiry into #hurricanehilton – #hurricanehiggins is already taken – the findings have dropped into my inbox. The best news is that Adam Sterry has got his points back. Remember? He was docked 10 places for not lowering his speed sufficiently when the yellow flags came out in the opening MX2 race. There’s not been a bigger injustice since the lapscorers at Weston missed me twice – Adam, I’ve been feeling your pain. In other news, Marc de Reuver has retired. The burning hunk of Dutch love broke a bunch of stuff – including his back – a few weeks ago. The good news is the damage is only temporary, the bad news is we won’t get to see him hanging it out anymore. And no-one could hang it out like him. I’ve got two abiding memories of Marc. The first is at the Irish GP in the early noughties. Fresh on the back of saying he was going to be the next big thing in the AMA, Mike Alessi had a wildcard ride there and De Royver (not De Roover) passed him like a soft stool, looked back over a table top and gave him a big ‘come-on y’puff’ wave. Alessi had nowt for him. In the second moto Alessi tried to go around the outside of Billy MacKenzie and the Scot stuffed him like a turkey. But, just like Metzger and my love chimes, that’s another story. The second memory is how he was at a bar and ‘went to make a little fart’ and drew mud. Being a Cloggie I bet he was wearing white strides too. And a bright shirt. But can you imagine anyone else admitting to that? Marc is a top bloke who was never afraid to speak his mind – we wish him well. 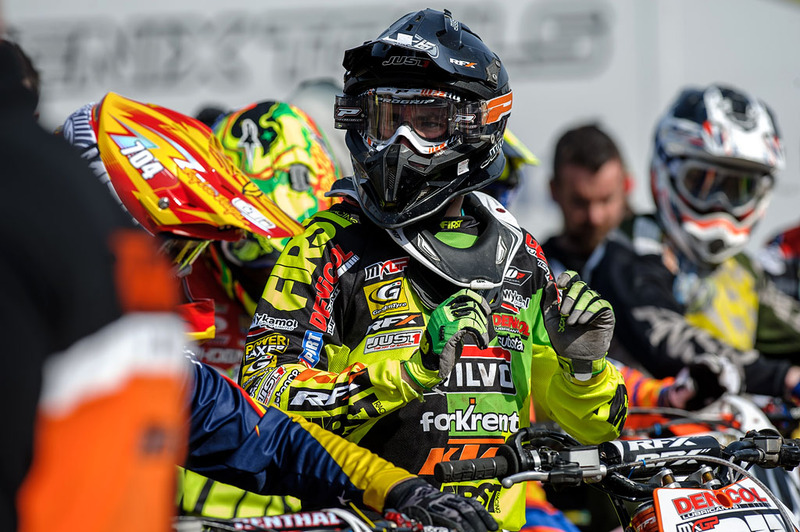 Nipping across The Pond now, the world championship heads to Argentina this weekend for round three. Will Ryan the Lion beat Tony the Tiger? Looking at the online pics the made-to-measure track’s flatter than my first girlfriend with a few big jumps so, yes, he’s got a chance. He’s not a cert like Jeffrey Herlings in MX2 but the real test doesn’t start until the GP circus rocks up in Italy on April 19.